There’s the inside-out skyscraper, the horizontal skyscraper and the wooden skyscraper. There’s a bizarre three-towered structure made to vaguely resemble an elephant, tusks and all. And then there’s the giant pickle. 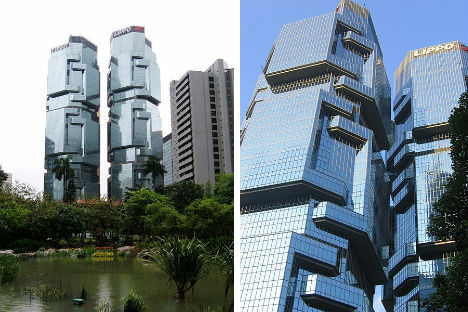 These 14 buildings are among the most bizarre in the world, and they stand out all the more for their sheer height. It’s the third-largest building in Europe, designed to look like a huge gate greeting visitors as they arrive in Belgrade from the west. 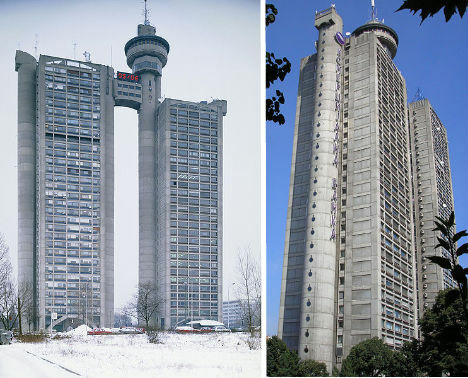 But Genex Tower is hardly a welcoming sight to many, called “phenomenally ugly” in more than one place on the internet and dismissed as one of the worst examples of Brutalist Architecture. The twin concrete towers, joined together by a revolving restaurant, are certainly among the stranger skyscrapers in the world. 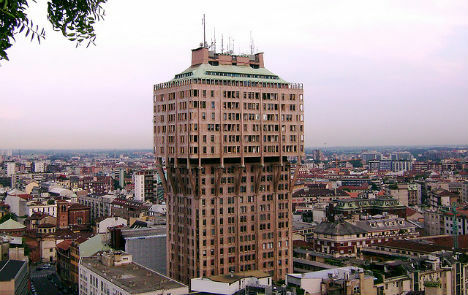 Is this the world’s ugliest skyscraper? 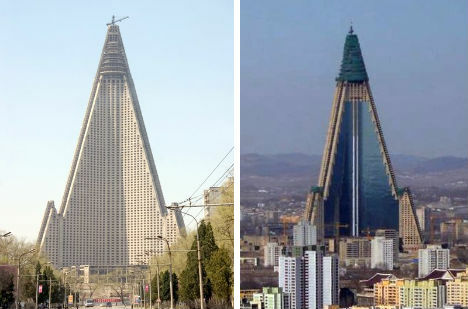 Veiled in secrecy in North Korea, the Ryugyong Hotel sat in construction limbo for so long that people thought it had been abandoned. Its unusual triangular shape paired with a raw concrete finish made it a bit of a laughingstock among architecture enthusiasts, though recent changes since construction resumed have made it look a bit less severe. 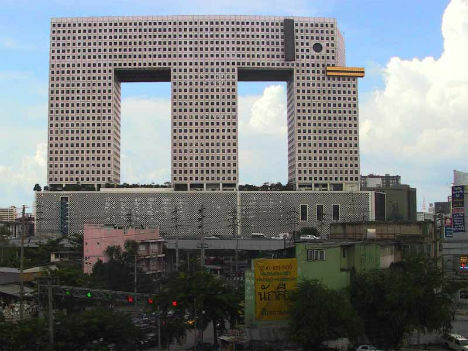 Perhaps the architects who designed this bizarre building in Bangkok stepped back from their plans and thought, hmmm, this set of three concrete blocks needs something. We know – round windows for eyes and shapes that vaguely suggest ears and tusks! Or something. When you spot this skyscraper in the Bangkok cityscape, there’s no question of what it’s supposed to be. 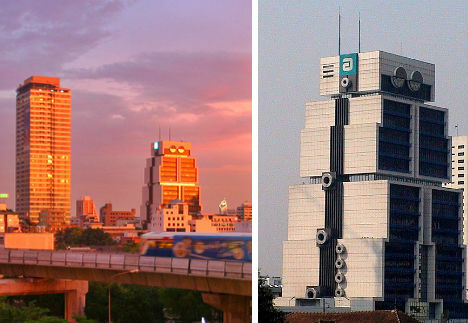 The Robot Building was designed for the Bank of Asia to reflect the computerization of banking and is one of the last examples of modern architecture in the city. 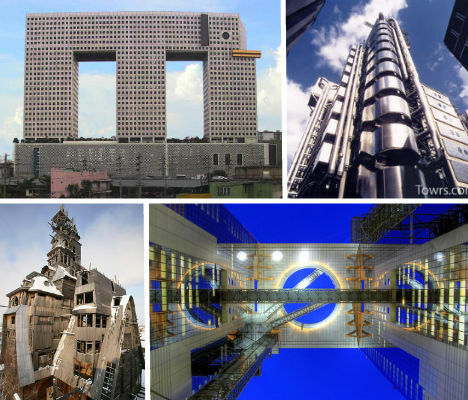 Architect Sumet Jumsai, who reportedly found inspiration in his son’s robot toy, made the building so blocky as a protest against the neoclassical and high-tech postmodern architecture that was sweeping the world in the early to mid 1980s. 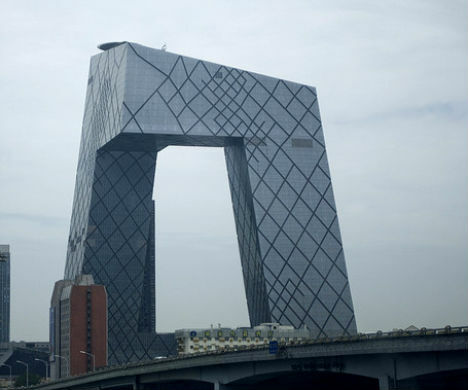 This 44-story skyscraper, which serves as the headquarters for China Central Television in Beijing, earned the nickname “big boxer shorts” soon after completion in 2009 for its rather unusual shape. It’s described as a loop of six horizontal and vertical sections and figuring out how to translate the design into a structural reality was no easy task, especially in a seismic zone. Why is that tower shaped like a mushroom? Standing tall in the city center of Milan, the Torre Velasca definitely contrasts with surrounding architecture, though it was designed to be a modern interpretation of typical Italian medieval castles when it was created in 1954. It’s a divisive presence in the city, with some residents regarding it with affection and others bemoaning its dominance of the skyline. 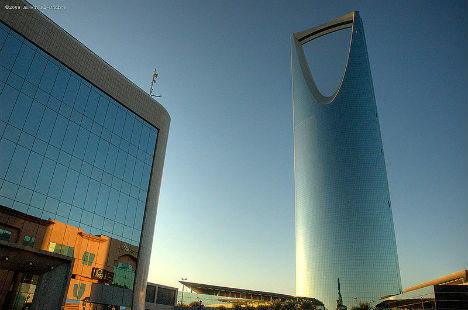 With its unusual keyhole design, the Kingdom Centre in Riyadh would be a standout even if it weren’t Saudi Arabia’s tallest skyscraper and the world’s second tallest mosque. Also known as Burj Al-Mamlaka, the Kingdom Centre was selected as the world’s most well-designed skyscraper in the 2002 Emporis Skyscraper Awards. The architects created the keyhole in the top in order to conform to city laws that don’t allow occupied floors above a certain height. 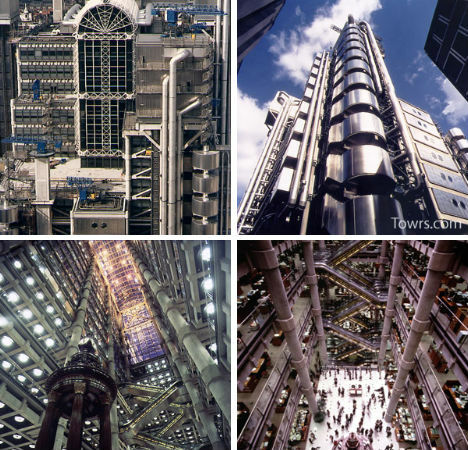 The Lloyds of London building is undeniably weird between its mish-mash of architectural styles and the bizarre jumble of structures clinging to its exterior. The building, which has all of its ‘guts’ including water pipes and elevators on the outside, was ostensibly designed this way so that the interior would remain uncluttered. Whether or not this approach worked (bottom two photos) is perhaps a matter of personal opinion. Distinctive? Definitely. 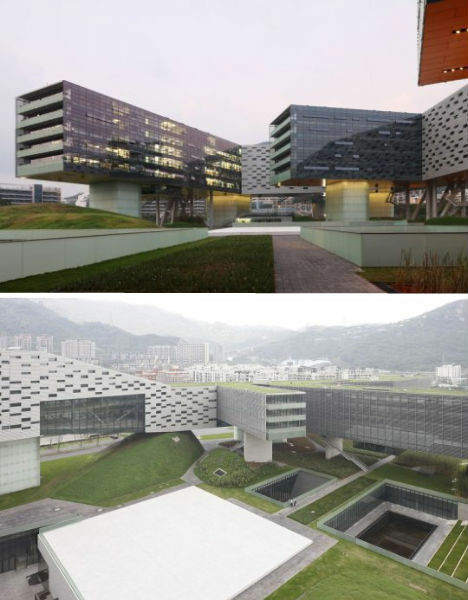 Dubbed the ‘koala tree’ for its resemblance to koalas clinging to a trunk, the Lippo Centre in Hong Kong is unlike any other office building in the world. American architect Paul Rudolph hoped to make these towers less severe with C-shaped clusters of windows that stand out in relief against the exterior. 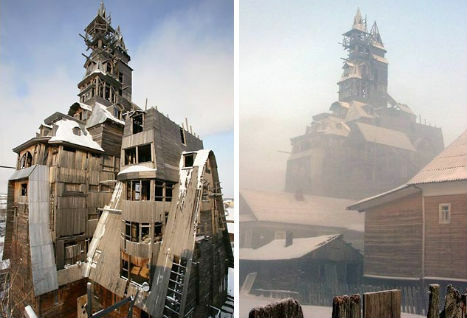 Built by a single man out of an improbable material, Russia’s wooden skyscraper is believed to be the tallest wooden house in the world at 144 feet and 13 stories. Nikolai Sutyagin, a former gangster, spent 15 years continuously adding additional floors to his home because he was never satisfied with the way it looked. The structure is crumbling and neighbors worry about fire, but for now it’s certainly quite a sight. 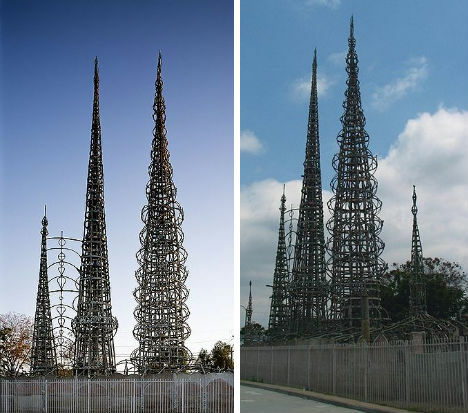 Reaching over 99 feet into the air, the Watts Towers – also known as the Simon Rodia Towers for the Italian immigrant who spent decades building them – aren’t exactly skyscrapers. They’re more like towering sculptures. But the steel pipe, rod and wire structures are undoubtedly landmarks in the Watts district of Los Angeles and are now listed on the National Register of Historic Places. 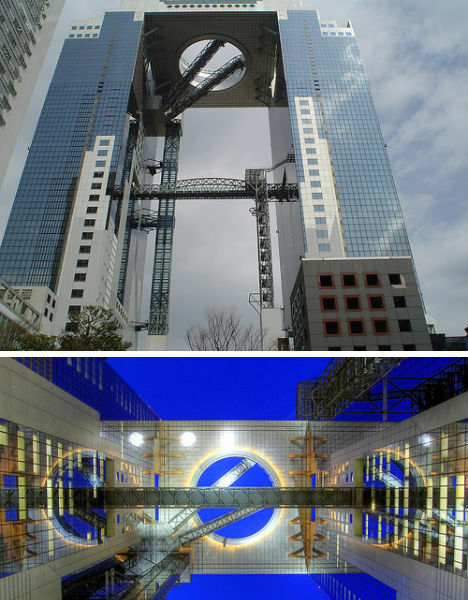 Strange and futuristic, the Umeda Sky Building in Osaka features bridges and a glass-enclosed elevator that criss-cross the empty space between two towers, which are connected at the top by a rooftop observatory. The building is so tall, it provides a 360-degree view of the city. 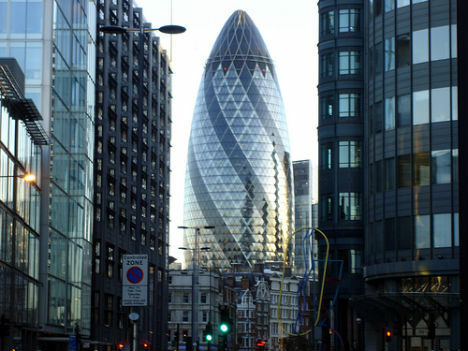 It’s been called Gherkin, Towering Innuendo and Crystal Phallus, but the unorthodox building that stands out like a sore thumb in London is officially known as 30 St Mary Axe. Designed by Norman Foster, the skyscraper was purchased for over a billion U.S. dollars, making it Britain’s most expensive office building. Who ever heard of a horizontal skyscraper? It may sound strange, but it actually exists, and it’s one of the most iconic designs in famed architect Steven Holl’s repertoire. Also known as the Vanke Center, the horizontal skyscraper looks like a series of towers turned on their sides and suspended above a tropical landscape in Shenzen, China.